LoveRaw have a range of honestly healthy drinks and snacks that you can trust. We were asked to refresh the brands current packaging starting with their newest product - Butter Cups. 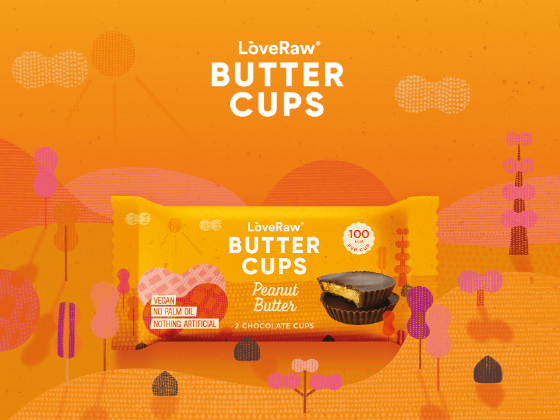 LoveRaw Butter Cups are the conscious way to satisfy your sweet tooth, made with only a handful of real ingredients. For each flavour we created a whole little flavour themed world to illustrate the filling inside. Salted caramel has a scene of surreal drippy trees and gooey topped mountains, while peanut butter has rolling peanut hills and similarly shaped trees. Packed with textures and a vibrant palette, these are proof that healthy doesn't have to mean bland.